Wolfbastard are a band from the United Kingdom that plays a mixture of black metal, d beat and crust and this is a review of their self titled 2015 album which will be released in October by UKEM Records. Horror movie samples start off the album before going into more of a heavier musical direction which also mixes crust and raw black metal together along with some high pitched screams and deep growls that are brought in at times and the faster sections also bring in a great amount of blast and d beats. Most of the black metal elements on the recording are rooted in the early 90's second wave Norwegian style and some of the riffs also use a small amount of melodies and you can also hear elements of thrash in some parts of the songs and all of the tracks stick to either a mid tempo or fast paced musical direction and all of the musical instruments have a very powerful sound to them and as the album progresses the vocals start adding in more of a shouting punk approach to singing and there are no guitar solos or leads present on the recording. Wolfbastard plays a musical style that takes raw black metal, d beat and crust punk and mixes them together to create a sound of their own, the production sounds very heavy and raw while the lyrics cover violent, hateful, Satanism and Anti Religion themes. In my opinion Wolfbastard are a very great sounding mixture of black metal, d beat and crust punk and if you are a fan of these musical genres, you should check out this band. 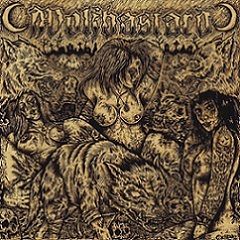 RECOMMENDED TRACKS INCLUDE "Goat Tyranny" "Death Filth Disease" "Lupine bastards" and "Summoning The Antichrist". 8 out of 10. Thank you for this review. It means a lot to us! Keep up the good work with the zine!